Invisible to the naked eye, nematodes that parasitize plants are a huge threat to agriculture, causing billions of dollars in crop losses every year. New research shows that these tiny worms use a specialized hormone to help them feed from the plant—a finding that could one day lead to crop plants with enhanced resistance to these devastating agricultural pests. “Cell cycle regulation is a key aspect of plant development and one of the first events altered during the formation of the feeding sites nematodes use to acquire nutrients from host plants,” says Melissa Goellner Mitchum, a researcher at the Bond Life Sciences Center and a plant sciences professor at the University of Missouri. Doctoral student Carola De La Torre and postdoctoral fellow Demosthenis Chronis worked with Mitchum to determine if nematode infection alters the cytokinin signaling pathways plants use to regulate growth and development and how the process changes due to nematode infection. “As part of our research, we examined the activation of different components of the cytokinin pathway in response to nematode infection,” De La Torre says. 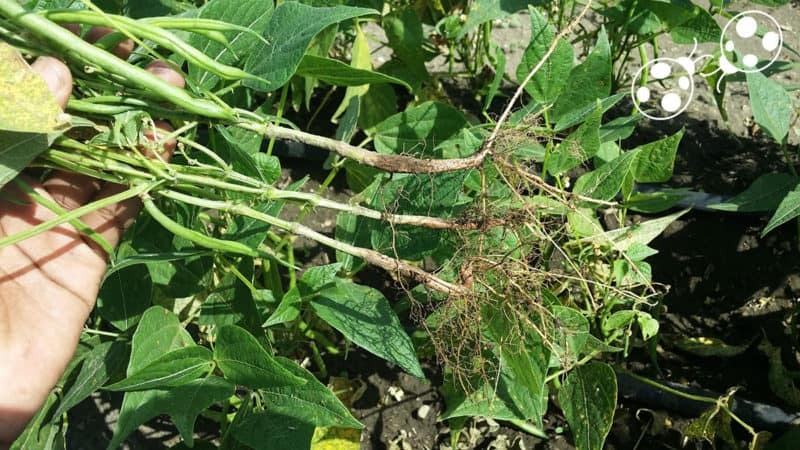 “Also, we evaluated numerous plants that lacked the presence of these components and found that most of these plants were less susceptible to nematode infection. Mitchum’s team worked with Florian Grundler’s group at Rheinische Friedrich-Wilhelms-University of Bonn, Germany, who further analyzed the connection between cytokinin and nematodes. Using advanced genetic tools, they discovered that nematodes create their own form of plant cytokinin and that, by secreting the hormone into the plant, they actively control the cell cycle leading to the production of ideal feeding sites to support their development. These findings show the ability of an animal to synthesize and secrete a functional plant hormone to establish long-term parasitism. “Understanding how plant-parasitic nematodes modulate host plants to their own benefit is an essential first step in finding new technologies needed to develop crop plants with enhanced resistance to these devastating agricultural pests,” Mitchum says.